The summer teaching course will be June 27 - August 16, with no classes on July 4 or July 5. Please block out 1-4pm each day in the regular course; some weeks we'll only use 4 of the 5 days. High school math camp will be the weeks of July 15 through 19 and July 29 through August 2 (please block out noon-5pm all days these weeks). The final week, August 12 through 16, will probably be devoted to guest teaching and not include any class meetings, although this isn't guaranteed; we may need to move some classes to work around the guest teaching schedules of graduate students, or the schedules of our guest speakers. 1 Th June 27 pre-course work Introductions, syllabus, goals of M147, good/bad learning experiences, categories of features of good ones; settings learning goals (importance, content vs higher-level, two hypothetical courses), brainstorm assessment of a tricky goal. Fr 28 prepare 5-min talks, MC1 goals 5-minute presentations (feedback forms, videocamera); brainstorm benefits of lecturing vs of reading, features of good lectures, brainstorm evaluation of one math camp goal. Tu 2 Duckworth, video response Discuss Piaget & Duckworth, favorite Duckworth idea, instructor examples of cooperative learning, brainstorm advantages and disadvantages; exercise on coop lesson plan for chain rule. We 3 MC1 topic, lesson plan, Skemp Discuss Skemp, draw concept maps, commit to two MC1 goals, dissect MC1 goal assessment plans; classroom assessment techniques. 2 M 8 sketch plan for MC1 Feedback/dissection of MC1 plan, math goals, exercise on assessment questions; pairs exercise adding CATs to chain rule lesson plans. Tu 9 first 2 days MC1 lesson plans Feedback on lesson plans; readings on coop learning, jigsaw exercise on coop learning plan for Math 20, good blackboard technique. We 10 5-min lecture + Hativa 5-minute lectures, feedback, brainstorm blackboard technique; discuss Hativa, MC1 assessment plan. Th 11 all lesson plans for MC1 Feedback on lesson plans; classroom management. 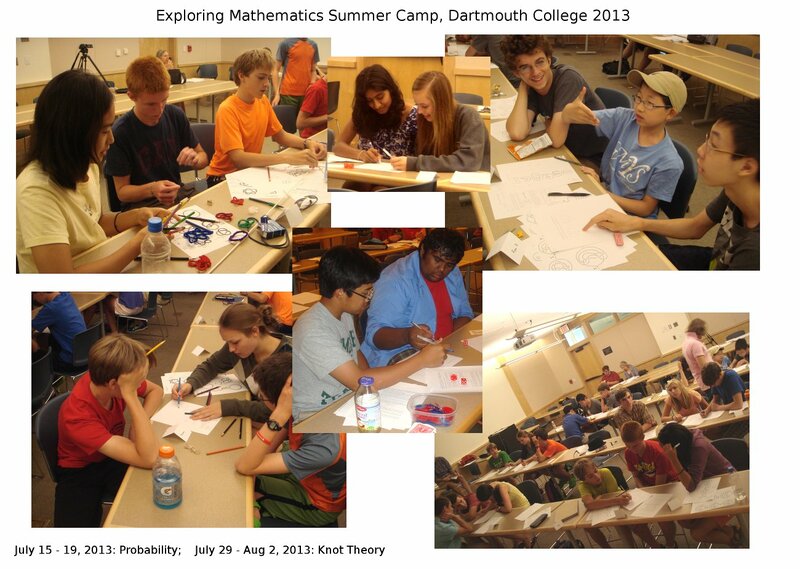 M 15 - F 19 Math Camp 1. 1-4pm each day. (Meet at noon; debrief 4-5pm). Topic chosen: probability. M 22 MC2 topic, goals Questionnaire. MC1 feedback, discuss MC2 topic, goals, Bloom's taxonomy, categorizing FTC problems; creating structured exam questions. Tu 23 MC2 sketch plan, eval Felder-Silverman learning styles (questionnaire), writing lesson plans for FTC addressing all learning styles; Pygmalion effect, discuss MC2 assessment. W 24 1st MC2 lesson plans Discuss lesson plan, teaching successful collaboration; using writing exercises in math. Th 25 5-min lecture; MC2 days 1-3 Vocal warm-up & dynamics, 5-minute lectures; discuss remaining lesson plans. M 29 - F Aug 2 Math Camp 2. 1-4pm each day. (Meet at noon; debrief 4-5pm). Topic chosen: knot theory. M 5 Syllabi and course texts; 1:30-3pm: Carl Thum and Leslie Schnyder from ASC, Larissa Hopkins from SAS, Natalie Hoyt from Undergraduate Deans' Office; dress code, honor code. Tu 6 find statements, Krantz Teaching statements, Grading rubrics, Gender in math and science; 2:40-4pm: Cynthia Tobery (DCAL). W 7 own TS, bring qu's 1-2:25pm: TM Mosley (OPAL). 2:40-4pm: Experienced graduate instructor advice session. Th 8 5-min final pres 2:40-4pm: faculty advice session. Please upload homeworks and lesson plans to the m147x13 folder on DropBox. You will receive instructions by email about this. Here is the directory of photos from the discussions, and a montage from the math camps.